This zip up hoodie is what every Doctor Who fan needs specially the once that like the 10th Doctor best. The Doctor Who hoodie looks like his overcoat and you can see his vest and tie under it BUT when you open the buttons then his vest appears (click on the picture to see it) and there is also where you find the zipper. 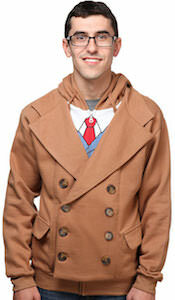 Of course that makes this Doctor Who hoodie better at keeping the wind out and and even more fun item to own. You can get this Doctor Who costume hoodie in adult sizes Small – 3XL and yes men and women will love to have one.